Home > Heavy Duty V Belts > V-Belts. A, B, and C Sections. Standard and Kelvar Construction > A-Section (Classcial) V-belts. 1/2" Wide > A101 Classical V-Belt. > A101-KC Ultrapower V Belt. Kevlar Wrap A101 Industrial V-Belt. 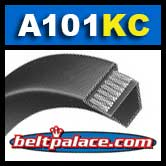 A101-KC Ultrapower V Belt. Kevlar Wrap A101 Industrial V-Belt. 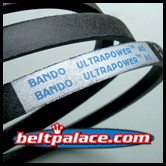 A101KC BANDO ULTRAPOWER AG Belt. Kevlar Wrap A101 Industrial V-Belt. A Section = 1/2” Wide, 103” Length OC (2616mm). Features superior “clutching” Kevlar/Aramid fiber cover for high durability and extra long service life. Heat and oil resistant. NAPA-Sunbelt, Grainger, Ametric (low grade) A101K. OEM REPLACEMENTS: John Deere M110978, Stens 265-014, Cub Cadet: 754-04219, 954-04219, OCC-754-04219, MTD: 754-04219, 954-04219, Rover: 754-04219, Troy-Bilt: 754-04219, 954-04219. A101 V-Belt. Consumer Brand A101 V-Belt. 1/2" Wide x 103” Length OC. Replaces Standard 4L1030 FHP V-Belts.